The Wordless Book, first designed with only three pages–black, red, and white–was introduced by Charles Spurgeon in 1866. Preaching at the Metropolitan Tabernacle in London, his sermon was entitled “The Wordless Book.” Mr. Spurgeon told of an old unnamed minister who had put three pages together and often looked at them to remind himself of his sinfulness, of Christ’s blood poured out for him, and of the “whiter-than-snow” cleansing provided for him. It is not known when the gold page was added, but it brought another dimension to the book, depicting the love of God and the glories of His heavenly home. Nine years later, D. L. Moody used the book of colors at a children’s service where an estimated 12,000 were present to hear his message on “a book with four leaves–black, red, white and gold.” “Tell us a story, Fanny. Tell us another!” the children begged. Fanny Crosby, the famous hymn writer, would often take from her purse a little Wordless Book and tell the children, whom she dearly loved, the story of the Savior. In 1895 the book was taken to India by Amy Carmichael. Amy and her helper made a satin flag of gold, black, red, and white, hoisted it in the cart pulled by oxen and went from village to village in southern India sharing the gospel. “A most useful text for an impromptu sermon,” Amy commented. In smaller groups she used the little book itself. Ruth Overholtzer, wife of Child Evangelism Fellowship® founder, J. Irvin Overholtzer, discovered the book in 1924. She found it through a bookstore operated by Dr. Harry A. Ironside who became pastor of Moody Memorial Church in Chicago. The Wordless Book was being published in London at that time. When CEF® began to print the little book fifteen years later they added green to represent Christian growth. They also published a leaflet with instructions on how to use the book. Scripture verses were included for each page. Although colors have been added over the years, the story it tells has never changed. Each time someone shares The Wordless Book, those listening learn about Heaven and God’s love for them, the darkness of sin, the blood of Christ, a clean heart and how to grow in Christ. The Wordless Book is still being used today. In fact, over 40,000 wordless books were ordered from CEF in 2016! The booklet is available through CEF Press. You can choose which size (2” x 3”, 3.5” x 3” or 8.5” x 11”) that will best fit your needs. You can also share the Gospel story with two other evangelistic tools. 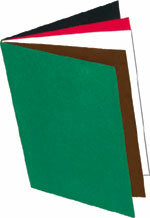 The Gospel Flipper-FlapperTM incorporates the colors and symbols of The Wordless Book. 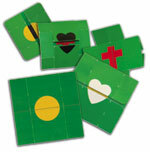 The children will be amazed as you flip through the symbols while sharing the Gospel. They will want to try it themselves! The Gospel Turnaround is easy to handle and requires a simple manipulation as you turn the tool around to form all of the symbols. It is so easy, the children will catch on and will soon be sharing the Gospel as well! To learn more about these effective teaching tools, prices and how to order, visit CEF Press. There, you will find more ways to share the great news of God’s love.